What is the price of a General Admission Day Ticket? Do I have to purchase a ticket for my toddler? Do you offer a Senior Discount? Do you offer Military / Public Service Discounts? Do you offer Group Rates? What if we arrive later in the day? What does my paid admission include? May I purchase reserved seating for concerts? What is included with my Season Pass? for parking again? What is the mailing address and phone number for Magic Springs? regarding food allergies? Does Magic Springs allow smoking? Is Magic Springs’ handicap accessible? What forms of payment do you accept? Do you have an ATM? Does Magic Springs have lockers for rent? Do you have strollers and wheelchairs? Do I get reimbursed if the park closes due to inclement weather? May I wear swimwear in the theme park? I lost a possession on a ride. How do I get it back? Do you serve alcohol in the park? Is there a dress code in the water park? Do I have to purchase the use of a tube for the water attractions? Can we bring our own flotation devices? What is the price of a General Admission Day Ticket? $59.99 + tax at the gate every Saturday, $45.99 + tax at the gate Sunday-Friday. Once purchased, you can upgrade to a Season Pass for an additional charge before leaving the park on the day your ticket is scanned. Save $10 and time from ticket window lines when you buy your general admission ticket online. Do I have to purchase a ticket for my toddler? Children 3 years of age and younger receive FREE admission to Magic Springs. Children shorter than 48" in height are admitted for $35.99 + tax Sundays through Fridays and $39.99 + tax on Saturdays. These tickets may be purchased HERE or at the ticket window at the same price. Yes, seniors age 55 and older are admitted for $35.99 + tax Sundays through Fridays and $39.99 + tax on Saturdays. These tickets may be purchased HERE or at the ticket window at the same price. Do you offer Military / Public Service discounts? Yes! With ID or badge $29.99 + tax for military and first responders (Police, Fire and EMT). Family members are $35.99 + tax when. Yes! We offer discounted rates for groups of 15 or more guests. You save when you book in advance; book with one of our Group Event Planners a minimum of seven (7) business days in advance of your visit to grab the best discount! Ask about catering options for groups of 75 or more. Go to Groups pages Here. What if we arrive later in the day? Magic Springs offers admission for $22.50 + tax after 4 p.m. Sunday-Friday and $29.99 + tax after 7 p.m. on Saturdays. This price is available ONLY at the gate. For info on other Park Promotions contact us at 501-624-0100. What does my paid admission include? Admission includes all day use of rides and attractions (excluding prize winning games or additional up-charge attractions) in Magic Springs Theme and Water Park. Admission to the concerts IS included in your ticket price if you attend on one of our concert dates. May I purchase reserved seating for concerts? What is included with my Season Pass? FREE monthly Online Coupons for use throughout the park! Find them HERE. How much does it cost to park at Magic Springs? Daily parking is $15 per vehicle or you may upgrade your Season Parking Pass for $34.99+tax. Full 15-passenger vans or larger, buses and charter buses park at no charge. After parking my car, can I leave and come back without paying for parking again? You may leave and re-enter on the same day by showing your parking receipt for that day to the parking attendant. If you would like to leave the park, have your hand stamped before exiting and you may re-enter for no extra cost. What is the mailing address and phone number for Magic Springs? Are there height restrictions on your rides? Absolutely. The safety of our guests is our top priority and we strictly adhere to the manufacturers’ height restrictions that are posted at the entrance to each ride and attraction. A list of height restrictions is available at the Guest Services office located at the front admission gate and on our web site. Click HERE to view ride pages. 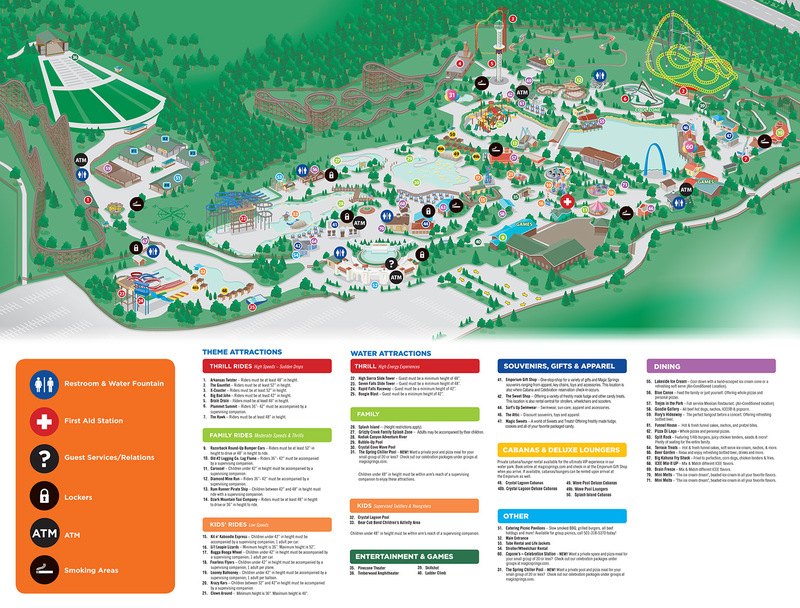 Our park map is available online. View park map. In addition, once you arrive at Magic Springs, there are park maps available at Guest Relations. Can we bring an ice chest and food and drinks into the park? Magic Springs does not allow any outside food or drinks to be brought into the park, except on select Sundays throughout the season - Learn more about Cooler Sundays here. Magic Springs offers a wide variety of delicious food at our many concession stands and restaurants. We also have picnic tables in an area outside of the park for our guests. If you would like to leave the park, have your hand stamped before exiting and you may re-enter the same day at no additional charge. NO glass or alcohol! From hamburgers and fries to chicken or pizza, there are eateries for every taste conveniently located throughout the park. Salads are available, plus delicious treats such as funnel cakes and ice cream. Magic Springs proudly serves Pepsi products throughout the park for your enjoyment as well. Who do I contact if I have questions about the park concessions regarding food allergies? You may call 501-318-5308 for lists of ingredients or information. Does Magic Springs allow smoking? Magic Springs is a smoke-free environment. Smoking is allowed only in smoking areas, which are located at various spots throughout the park. Please check your park map for the designated smoking areas. Is Magic Springs’ handicap accessible? MasterCard, Visa, Discover, American Express, and traveler’s checks are accepted. Yes. The park has several ATM machines. Check your Park Map for locations. Does Magic Springs have lockers for rent? You should not leave your personal belongings unattended when visiting the park. There are several locker locations located near the front gate and the water park. Please refer to the park map for those locations. Lockers may be rented for $10 (small locker) or $14 (large locker) and you may pay at the locker with cash or debit/credit card. Do you have strollers and wheelchairs? Strollers and wheelchairs are available for rent. Limited quantities are available on a first-come first-served basis upon presentation of a valid ID. Wagons and wheelchairs cannot be reserved in advance or taken outside the park. *All rentals are on a first come, first serve basis. *All prices listed are without tax. Do I get reimbursed if the park closes due to inclement weather? Magic Springs is an outdoor facility and some rides and water park attractions can be affected by weather conditions. For the safety of our guests some rides and attractions may be shut down for certain periods of time. Many of the park’s shops, rides, entertainment and other attractions may be enjoyed regardless of the weather. While we do not offer refunds on admission we do have a special should the park close for inclement weather. See Rainy-Day-RePlay for details Here. May I wear swimwear in the theme park? Yes, however for your own safety you have to wear a shirt and shorts over it. I lost a possession on a ride. How do I get it back? If your item is found or retrieved it will be taken to Guest Relations. You can inquire about lost items there or call 501-318-5312. Do you serve alcohol in the park? Yes. However for safety reasons, guests who are intoxicated or impaired by alcohol or drugs will not be allowed on the rides and attractions at Magic Springs. Also, as established by Arkansas law, alcohol may not be carried throughout the park. Is there a dress code in the water park? Proper swim attire is required. Conservative swimwear only (no thong bikinis or overly revealing attire). Bathing suits are required for all water attractions. Swimwear with zippers, buckles or any metal is PROHIBITED. ~ Blue jeans and/or any type of denim material, is not allowed in any of the pools or on any of the slides. ~ In addition, shirts, shorts, and shoes must be worn to ride all attractions outside of the Water Park. Do I have to purchase the use of a tube for the water attractions? No. Some attractions require the use of tubes. Limited supplies of one-time use tubes are available on a first-come, first-served basis. For your benefit and to cut down on waiting time in lines, you may rent a tube for your personal use the entire day. Season Tube Rentals may be added to any Season Pass for $19.99+tax; daily tube rentals cost $5. Can we bring our own flotation devices? For your own safety and the safety of our other guests we do not allow any outside flotation devices that do not have the Coast Guard Approved stamp. Life-jackets for small children are available free of charge at our tube distribution area. Please call 501.624.0100 for additional questions.